For those who might not be up on the latest acronyms, ICYMI stands for “In Case You Missed It.” More than 100 people showed up on Sunday for our first churchwide Mission Trip Interest Meeting to learn how to Live Sent with Shandon. In speed-dating style, nine Strategy Leaders gave quick overviews of their Global Missions Partners. Then attendees were able to choose two 10-minute breakout sessions to learn more. It was a fun, informative time that we plan to schedule on a quarterly basis in 2019. Make plans now to attend the next one: Sunday, February 17 immediately following 10:30 worship. As upcoming trips are launched, you’ll be able to apply, fundraise, communicate with team members, and manage your trip requirements online for most trips. If you can’t go, you’ll be able to give and pray. 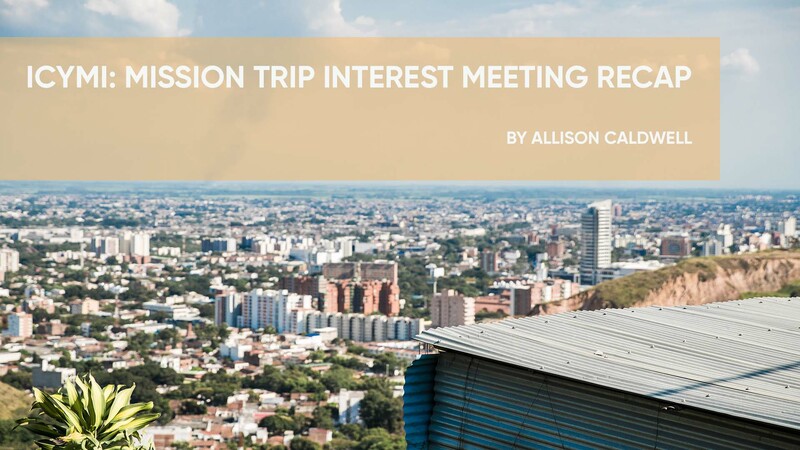 Stay tuned to eNews, the Mission Trips tab on the website, and the Missions Next Steps area in the Gathering Place to know when trips open up for applications. In the meantime, please pray that God will continue to use us to grow His kingdom—here at home, and around the world!